We’ve seen many small computer based on Intel Atom Bay Trail-T (Tablet) Z3735F/G processor lately including MINIX NEO Z64 and MeegoPad T01, which should ship by the end of the month (it keeps getting postponed). But Intel also makes Bay Trail-M (Mobile) processor for laptops, including Celeron N2807 dual core processor found in ECS Liva. Two new products based on N2807 processor has recently surfaced: Giada F110D and Asus E210. According to CPU Boss (see Google cache if link has problem), Z3735F has slightly greater multi-core performance than N2807, but the latter has better single thread performance based on Passmark. One key advantage of the Celeron processors over the Atom ones is that they support up to 4GB RAM instead of 1 or 2 GB for the Bay Trail-T processor. Giada F110D also has one version with a more powerful Intel Bay Trail-D (Desktop) Celeron J1900 quad core processor. SoC – Intel Celeron N2807 (Bay Trail M) dual core processor @ 1.58 GHz (Burst: 2.16 GHz – 4.5W TDP) or Intel Celeron J1900 (Bay Trail D) quad core processor @ 2.0 GHz (Burst: 2.14 GHz – TDP 10W), both with Intel HD graphics. Storage – Not included. Support 2.5″ SATA drive, or mSATA SSD, and comes with 4-in-1 (SD/MMC/MS/MS PRO) card reader. Connectivity – 2x Gigabit Ethernet. Optional 802.11 b/g/n Wi-Fi, and Bluetooth 4.0 module. It will run Windows 7/8.1, and Linux operating systems, pricing and availability have not been announced. 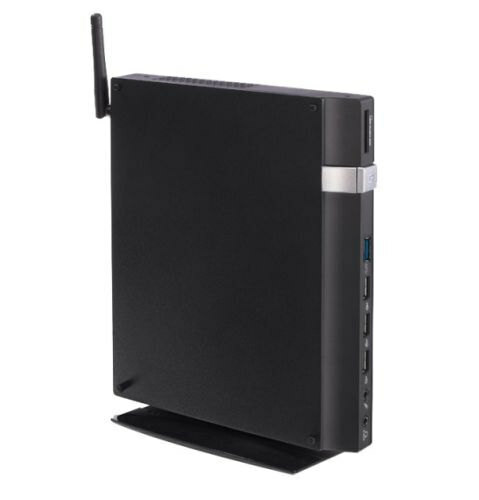 Asus mini PC is sold with a keyboard, mouse, an AC adapter with a power cord, a warranty card, a quick manual, and a VESA mount kit. It will ship with Windows Embedded 8 Standard, Windows Embedded Standard 7, or DOS (FreeDOS?). The latter is probably to let you install your preferred operating systems by yourself. Price and availability are unknown at this tage.More details can be found on Asus E210 product page. Having spent the last 20 years having to own a Wintel computer because Micro$oft and Intel muscled everybody else out of the market, I do not intend to ever buy another box with Intel inside. This week I have ordered an ODROID C1 mini PC that runs Ubuntu 14.04 and Android 4.4, cost me US$56 and does all that I need a PC to do. It gives me considerable satisfaction to see Intel and Micro$oft in recent times reduced to the point that they are virtually giving away product in order to maintain some pretence of market relevance. As far as I’m concerned, Micro$oft and Intel can go and do unspeakable things to each other. Well, there is one very significant benefit to Intel-based computers : one kernel to rule them all ! As screwed as we may consider BIOS/EFI/ACPI/… is, at least there is one single common platform and my 15 years-old PC can still boot a recent kernel/distro (while my 2 years-old Rockchip dongle shall not get any update and will very likely be dead in 5 years). Intel is back tracking on giving Chinese manufacturers access to their Atom Bay Trail SoC. Why is this? Intel does not want Chinese manufacturers to create and flood the market with cheap mini pcs that potentially be used for cheap Thin Client PC’s, with Gigabit ports etc. What happened when Chinese manufactures that make tablets wanted to use the SoC’s in mini PCs? They were gagged and stopped from doing so. This is what they fear, they’ll wipe out a massive most cooperate market and they don’t just want to do that. Continue to innovate ARM! You will succeed! Import tax depends on your country of residence. Happily, in Australia I don’t face an import tax. Yes. I too have a Rockchip dongle gathering dust 🙁 For me, what makes ODROID C1 special is that the chip manufacturer (AMlogic) and board manufacturer (Hardkernel) have demonstrated their support for Linux, not just any old Linux but Ubuntu 14.4, a very well respected long term support distro, available for download from the time of product release. This support includes the Mali-450 graphics, a major step forward. These factors combined with a substantial degree of compatibility with Raspberry Pi GPIOs and HATs and adequate performance as a general purpose PC give me confidence that ODROID C1 will be of immediate and enduring usefulness. As long se as the kernel source is available for a chip and uboot, its not to hard to roll your own distro or use buildroot or openembedded or yocto to build a custom image though it is nice and convenient to be able to use a distro. The big question is will be in 2015 or 2016 that Apple releases ARM based laptops and desktops. But I can see several Intel Z3735F/G based mini PCs being announced. Where did you read these projects have been stopped?